As mentioned on the main 3 Beat Media blog, a website was recently launched at BusyAuthors.com. This website will serve as the home of a new e-book series. The Busy Author’s Guide e-book series will offer practical book marketing, author PR, and business advice to authors. This information can be used by indie authors and traditionally-published authors alike. The emphasis will be on simplifying the business side of being an author and selling books so writers can spend more time writing without the sacrifice of shoddy business and marketing efforts. The first e-book in the series will be released by the end of February 2014 (and possibly sooner). 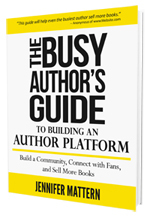 That e-book will be The Busy Author’s Guide to Building an Author Platform.